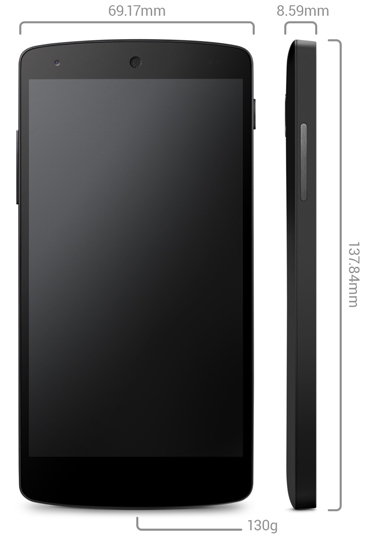 Yesterday Google finally made the Nexus 5 official, a phone that has been far from secret for months. Packing an incredibly powerful Snapdragon™ 800, 2.26GHz Quad Core processor, a 450MHz Adreno 330 Graphics Processor & 2 GB or RAM, the Nexus 5 is based on the LG G2 Superphone, with some minor omissions to keep the cost down. And speaking of cost, the Nexus 5 is without question the best value per dollar you will find in a smartphone, at only $349 Unlocked for the 16GB model, or you can get double the storage in a 32GB version for only $50 more at $399 Unlocked. You can pick up the phone now on the Google Play store, The can get the phone on all major carriers in the US except Verizon, who opted out of carrying it. You can grab the phone on a 2 year contract with Sprint right now for only $49.99 HERE. AT&T is making the device available on their network, but you will have to buy it from and call AT&T to activate it. You can also pick up the phone from Best Buy for the non-subsidized price. Newer PostEverything you think you know about Malware is wrong. Older PostXP Support ends in April, is your business prepared?